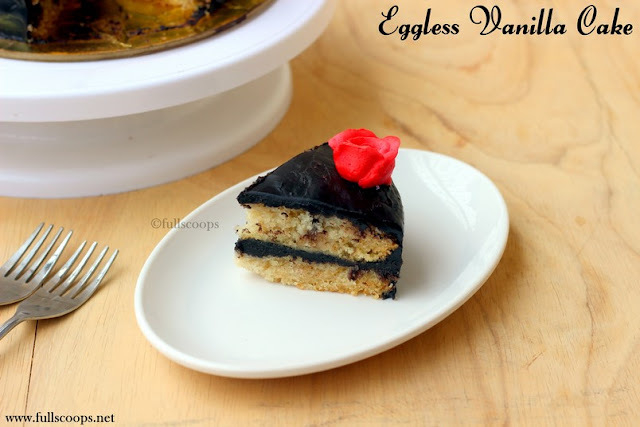 Eggless Vanilla Cake Recipe ~ Full Scoops - A food blog with easy,simple & tasty recipes! I have two favorite eggless vanilla cake recipes. This is one of them and the other one uses curd. Both these cakes always comes out very well. 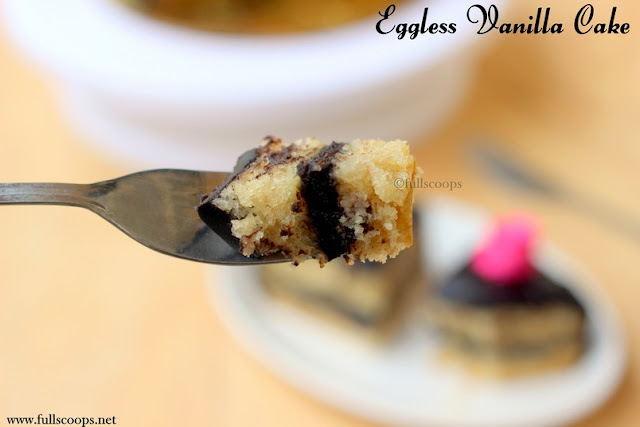 Whenever I need to bake an eggless cake for my friends I always use one of these two recipes. This recipe uses the simplest of ingredients that you will always have in your kitchen just like this eggless dairy free chocolate cake recipe. I love these recipes which uses simple ingredients and does not require too much of an elaborate preparation. This is a soft, moist cake which tastes great by itself. You need not frost this cake, if you don't want to. You can just have it with your evening tea or coffee. You can use butter or oil in this recipe. I have used oil as it keeps the cake soft and moist but you can use butter as well. 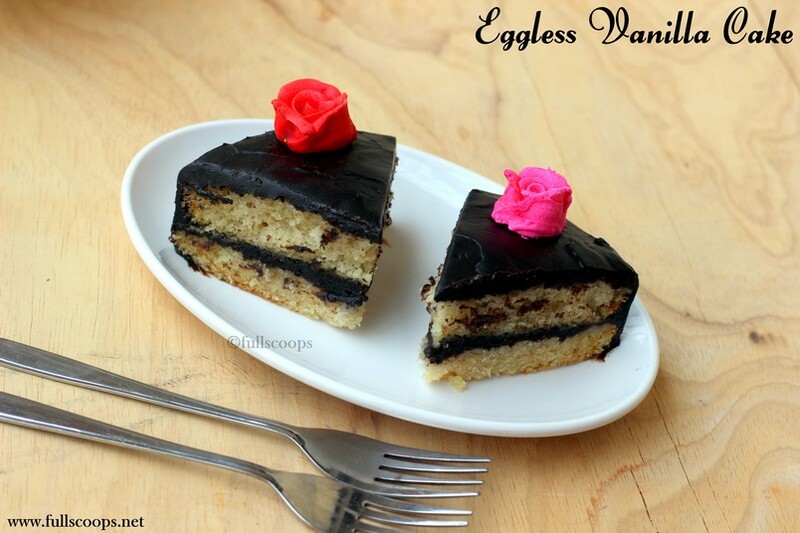 This recipe makes a small cake, you can use a 5 or 6 inch pan. If you want a 'taller' cake, use a 5 inch pan. I have used a 6 inch pan. If you want to layer this cake, then I suggest you bake 2 of these cakes in a 6 inch pan and you can layer it well. I have layered using only 1 cake so it looks small. But this is just for family and close friends so this size was perfect for us. I used a 6" cake pan. Line the cake pan and grease well. Preheat the oven to 180 C.
1. Add the milk, sugar, vanilla in a bowl. 2. Next add the oil and vinegar and whisk well. 3. Sift in the flour, baking soda, baking powder and salt. 4. Fold the dry ingredients gently into the wet ingredients to form a smooth batter. Do not over mix. 5. Pour into the greased pan and bake for about 25 - 30 minutes. Start checking after 25 minutes until a tooth pick inserted comes out clean. 6. Remove and cool in the pan for 10 minutes and then turn onto a rack and cool completely. 1. I used oil for this cake. Use any flavorless, odorless oil. 2. After adding the dry ingredients, do not overmix. Over mixing can make your cake hard. 3. If you want to make this into a chocolate cake, replace 1/3rd of the flour with cocoa powder. 4. I baked for 25 minutes and then reduced the temperature to 160 and baked for 5 more minutes. 5. 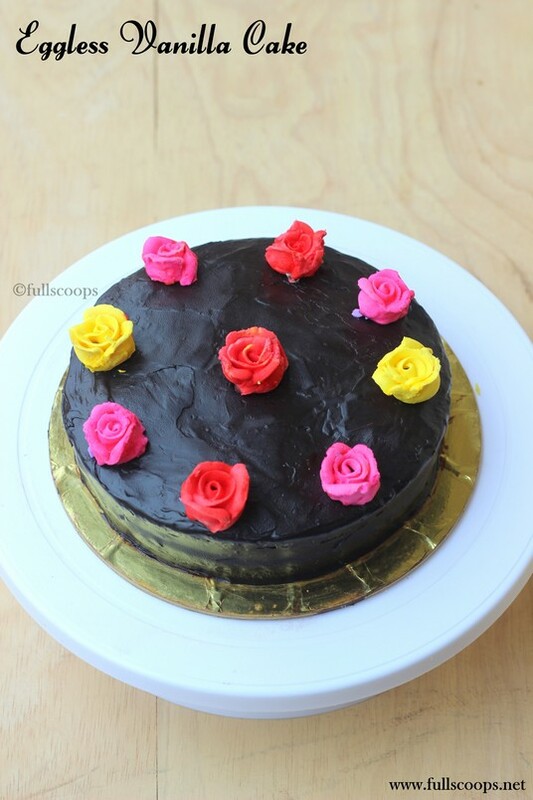 If you want to frost the cake, check this link on how to frost cakes easily. 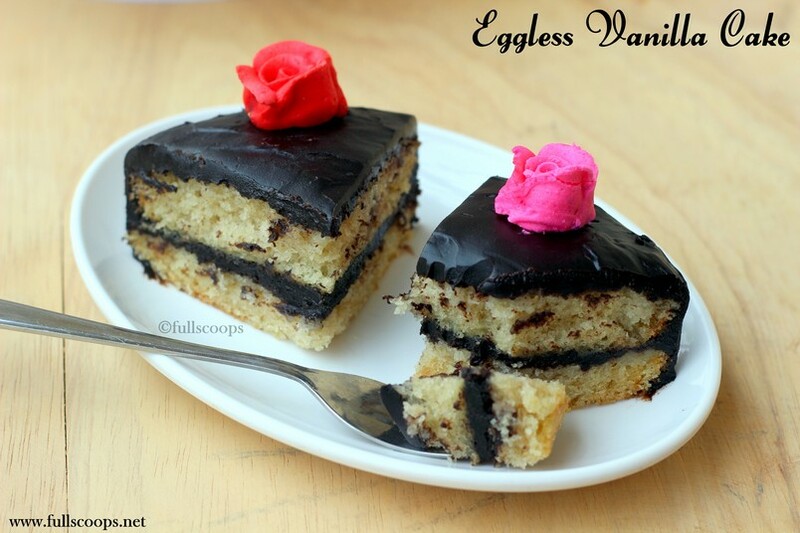 And here's a post on how to make ganache. wow fantastic sponge Cake , looks fabulous dear :) So perfectly done !! 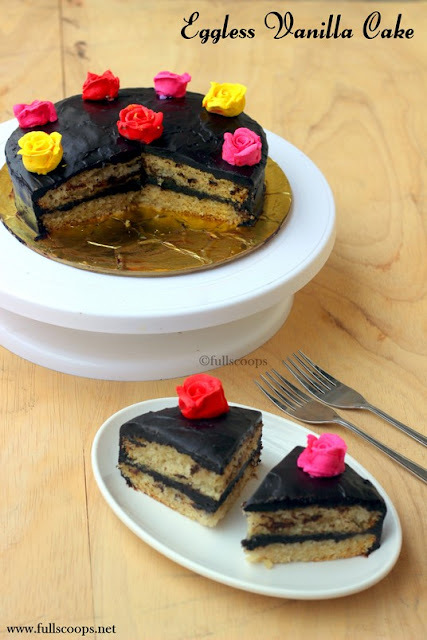 So soft and spongy cake ...Perfectly made !! Yes you can. Let me know how it goes! thanx... i will try and give u the feedback. am also planning 2 go for the ganache.just wondering if i can replace 2tblsp of APF with vanilla custard powder( i have a good stock!!!). 'coz i've read in blogs that cake flour is made when 2tblsp of flour is replaced by corn starch.your suggestions will be of great help. Yes cake flour is made by replacing 2 tbsp of APF with corn flour but why do you want to use custard powder? I know custard powder has corn flour but it also has other additives. Anyways, I have never used it, try it at your own risk. I can't post photos here, you can use any brand of white vinegar or apple cider vinegar. Hi, lovely blog! I have a query 1/2 cup is granulated sugar or powdered sugar? The cake raised properly and flat ....and tuned yummy . I added tutti fruity also to the. Thanks for the wonderful recipe. Tried ur eggless vanila cake. Came out well.i tried a topping with choclate ganache ..